A growing body of research, investigating stimuli that increase the risk of antisocial behavior, has emerged; however, an insufficient amount has considered age as a regulating factor. It was predicted that, as males grow older, they participate in less antisocial behavior. This present study examined links between levels of aggressive behavior and adult age groups, by evaluating males in early, middle, and mature adulthood (“N” = 150; 22-75 years old; 100% males). The results of multiple-choice questions, based on hypothetical scenarios, indicated that there were substantial differences in the levels of aggressive behavior of early-adult males, compared to that of middle-aged and mature-adult males. Middle-aged and mature-adult males were about 1.5 times as likely to behave in low levels of aggression as early-adult males. When compared to the middle and mature groups, early-adult males were almost twice as likely to behave in moderate levels of aggression and about 3.5 times as likely to behave in high levels of aggression. There was relatively no difference, regarding the levels of aggression demonstrated by middle-aged and mature-adult males. It was concluded that male psychological development, from the course of early adulthood to middle adulthood, is considerably linked to the level of antisocial behavior in which they display. In everyday society, numerous male adolescents adopt humanity's moral principles and behave accordingly; however, it is common for some to develop, what we call, antisocial behavior. Between 4 and 6 million American children have been suggested to exhibit antisocial behavior issues . While the majority of these juveniles break their foul habits, we find that some individuals continue to act this way in adult life, causing them to engage in abusive relationships, have trouble maintaining employment, and commit crimes .Antisocial behavior has been defined as conduct that defies social standards, guidelines, or laws, and hurts others or society (e.g. lying, stealing, or acting aggressively); comparably, aggression is recognized as hostile or violent behavior or attitudes toward another, with the eagerness to attack or challenge . Past research identified two subgroups of antisocial youths: “a small, early-occurring, earnestly disturbed group that is recognizable in childhood through actions, such as harming animals and peers, and is obstinately antisocial across the lifetime” and “a larger, later-occurring, less extreme antisocial group that acts more antisocially during adolescence, somewhat due to peer encouragements, and outgrows this behavior during the early adulthood life stage” . This article has been based on the idea that the majority of males abandon these antisocial attributes, as they “grow up”. Antisocial behavior escalates when a person reaches his late 20s, but usually “burns out” beginning in the mid-thirties . Past research on hormone levels and aggression in men involved interviews and psychological tests of male participants, in middle and mature adulthood . Following the findings of these assessments, researchers proposed that the younger males, who generally tend to have more testosterone than older males, behaved in more aggressive manners . Earlier research, conducted by Monahan , suggested that violence is more common if the prospective offender is of lower socioeconomic status, from a disadvantaged minority, less educated, of a lower intellectual level, or has a history of juvenile violence and/or alcohol and/or substance abuse, as well as an unstable school or vocational history. He also recommended that males and young individuals, of the age range of 30-35, are the most potential perpetrators of aggression . Letich  supported this theory by suggesting that 30-year-old malest end to have the least amount of friends, due to their relentless competition and assertive behavior. Armstrong  described this group of 20 to 35 year olds as early-adults, those whose prime existence focuses on enterprise. It takes initiative for early-adults to undertake their various tasks of finding a home and a companion, starting a family, and finding a career . Armstrong  later described middle-aged adults (35-50 years old) as those who contemplate and develop a new understanding of life. Finally, mature-adults (50-80 years old) were described as people who have already placed their marks in the world, through family and work, and, therefore, focus on benevolence . McCrae supposed that, at the widest conceptual level, age differences or changes might trigger alterations in personality . It has been suggested that a child’s brain is more impressionable than that of an adult, but is that to say that the older an individual is, the more control they have over their own minds ? Begley  suggests that biological factors are purely excuses, rather than explanations of violence; She believes that experience is what renovates the brain. This article contradicts that belief, as this investigator considers if biology also causes an impact on psychological development. This article discusses whether age is a playing factor in the cause of antisocial behavior. The purpose of this study was to detect a pattern between antisocial behavior and male psychological development through age. This investigator’s main focus is based on forensic psychology; thus, the study of criminal or antisocial behavior, as well as triggering factors, comes to great interest. Further understanding of a causing factor of aggressive conduct, such as age, allows scholars to better analyze antisocial behavior and warn possible victims who may be affected by these crimes. Assisting in the recovery of victims of domestic violence or other types of physical abuse, while also understanding perpetrators, is of great importance to any individual who works with criminals, victims, and/or families. Links found between age and antisocial behavior could assist in the profiling of aggressive perpetrators. Therefore, it has been hypothesized that, as males grow older, they participate in less antisocial behavior. This hypothesis was linked to the theory that males in the early adulthood stage of life would partake in more antisocial behavior than middle-aged males and males in the mature adulthood stage of life. There were a total of 150 participants in the evaluation conducted, regarding aggression and antisocial behavior in men. Of the participants, 100% were males. The participants varied from 22 to 75 years of age. The study consisted of 3 sets of men; The first set belonged to the 20-35 early adulthood age group, the second belonged to the 35-50 middle adulthood age group, and the third belonged to the 50-80 mature adulthood age group. None of the participants were 35 or 50 years old; thus, they could only be placed in one age group. The average ages of the participants who partook in this survey were26.76 (early-aged adult), 42.5 (middle-aged adult), and 63.45 (mature-aged adult). A sizable 54% of the contributors were Hispanic, Latino, or of Spanish origin, while 42% were classified as White and 4% were classified as Asian. The academic achievements completed by the various young-adult contributors ranged from some high school to technical school or some college. The academic achievements completed by the assorted middle-aged contributors ranged from some high school to a Master degree. The academic achievements completed by the various mature-adult contributors ranged from some high school to a Master degree. The existing participants each resided in one of six U.S. states; 66.67% of the participants dwelled in New Jersey, 12.5% in New York, 8.33% in Florida, 4.17% in Utah, 4.17% in New Hampshire, and the other 4.17% in Maine. The socioeconomic status of each participant was not inquired in this analysis. The evaluation at hand is made up of multiple-choice questions. Every participant answered 100% of the inquiries on the questionnaire, after fully reading, comprehending, and signing an informed consent form. The opening instructions of the assessment advised participants that answering questions, which made them feel uncomfortable, was not mandatory. There are two bordered sections on the assessment. On the first section of the assessment, there was only one question, which involved the diagnosis of dementia and/or any psychiatric disorder, which required a direct, yes or no response. The remaining four questions in this first section provide a very specific cluster of multiple-choice responses, regarding gender, race or origin, age group, and highest level of education. Race was categorized in accordance with the identification style of the U.S. Census Bureau, while age was categorized into the stages of the human life cycle, developed by Dr. Thomas Armstrong [7,10]. The questions in the second section of the evaluation consist of scenario-based inquiries, along with diverse multiple-choice reactions (See Appendix 1).
. An example of one of these statements, regarding aggression, is “You are sitting in traffic, after a long day at work, as this driver tries squeezing into your lane and almost hits your car’s rear.”The retorts to this question involved “ignoring the driver”, “arguing with him through the car window”, or “getting out of the car and heading over to his, in hopes of harming the driver”. These responses, just like the other responses in this section, ranged on a 1 to 3 scale, with the least aggressive behavior as the first point and the most aggressive behavior as the third point. The study involved in this research included one yes or no question, 4 multiple-choice inquiries, regarding personal identification and academic level, and 20 multiple-choice questions, based on scenarios and individual reaction, within two sections of a typed assessment. Participants responded to the inquiries in relaxed environments, in the luxury of their own home or workplace. The survey was available on a webpage created by the researcher to individuals who may have been interested in participating. A participant would not be able to partake in the assessment if he were not familiar with the survey website. All females, any males under the age of 20 or over the age of 80, and any individuals who had been diagnosed with dementia and/or any psychiatric disorder at some point in their lives would not be able to partake in the assessment either. The minimum duration that a contributor took to focus on provoking situations was 6 minutes, while the maximum was 15 minutes. The mean duration of the study was 10.17 minutes. Following the participants’ completion of this assessment, the survey website’s configuration system separately added the times each of the three diverse levels of aggressive conduct appeared and organized these responses by using the three different age groups. The mean and standard deviation of each of the three levels of aggression were also calculated, according to age group (See Figure 1). Figure 1: Male Antisocial Behavior in Adulthood. 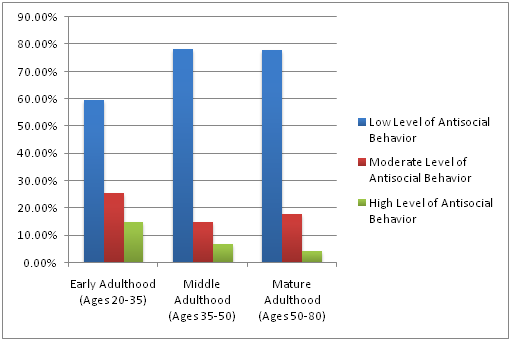 This figure illustrates levels of antisocial behavior in male participants of the listed adult life stages. The aforementioned process was used to compare the average level of antisocial behavior of early, middle, and mature adult-aged males. It was hypothesized that, as males grow older, they participate in less antisocial behavior. This hypothesis was linked to the theory that males in the early adulthood stage of life would partake in more antisocial behavior than middle-aged males, while middle-aged males would partake in less antisocial behavior than males in the mature adulthood stage of life. There was an adequate difference in the low levels of aggressive behavior of early-adult males, compared to that of middle-aged and mature-adult males. The results indicate distinctions in males’ tendencies to act in low levels of aggression, based on their placement in individual age groups. Middle-aged and mature-adult males were nearly 1.5 times likely to behave in low aggressive behavior than early-adult males. Males in middle adulthood responded with low antisocial behaviors about 78.33% of the time and males in mature adulthood responded in this manner approximately 77.86% of the time; early-adult participants responded in this manner about 59.55% of the time. There was relatively no difference, regarding low levels of aggression, found between middle-aged and mature-adult males. Correspondingly, there was a substantial variation in the moderate levels of aggressive behavior of middle-aged and mature-adult males, compared to that of early-adult males. The findings indicate differences in males’ inclination to act in moderate levels of aggression, based on their placement in individual adult age groups. Early-adult males were almost twice as likely to behave in moderately aggressive behavior as middle-aged and mature-adult males. The early-adult males responded with moderately antisocial behaviors about 25.45% of the time, while the middle-aged participants responded in this manner 15.0% of the time and the mature-aged men responded accordingly roughly 17.86% of the time. There was comparatively no sizable difference, regarding moderate levels of aggression, found between middle-aged and mature-adult males. Likewise, there was a significant difference in the high levels of aggressive behavior of early-adult males, compared to that of middle-aged and mature-adult males. The results indicate that there are differences in males’ tendencies to act in high levels of aggression, based on their placement in individual age groups. Early-adult males were about 3.5 times more likely to behave in high aggressive behavior than middle-aged and mature-adult males. The early-adult males responded with high antisocial behaviors 15.0% of the time, while middle-aged adults responded in this manner 6.67% of the time and mature-adult males responded accordingly 4.29% of the time. There was relatively no difference, regarding the high levels of aggression, found between middle-aged and mature-adult males. In detail, early adult males chose more responses displaying high and moderate levels of aggression than middle-aged and mature-adult males, who customarily rejected these levels of aggression in their responses. Following the completion of this assessment and extensive analysis, there has been an indication that male psychological development, from the course of early adulthood to middle adulthood, is significantly related to the aggressive level in which they behave. This information demonstrates that good men may be induced into behaving in evil ways by the means of provoking situations, but older males may be able to withstand at a more peaceful level . It was suggested that males in the early adulthood stage of life would partake in more antisocial behavior than middle-aged males and males in the mature adulthood stage of life. Pena et al. study agreed with this notion and also found that younger males justified their aggressive behaviors on a higher level than older adult males, insinuating that younger adults males may actually believe that their aggressive actions are reasonable. In regards to the concise literature review, regarding hormone levels and aggression in men, presented earlier in this article, it has been concluded that there is a connection between age and antisocial behavior; however, the research in this article contradicts the notion that middle and mature-adult males significantly vary in levels of aggression . There were some limitations in the analysis involving the particular topic at hand, as well as the diversity of the participants. When individuals come to face with their aggressive behaviors, they may feel uncomfortable. Although some participants might have indicated that their responses would be of low or moderate aggression, this information could be fabricated and untruthful. Likewise, the contributors were primarily Hispanic or White, with only a small percentile of Asians, which is to say that the findings in this particular article should not be applied to Asian men or males of other races. Additional limitations, involving the diversity of the study, include the fact that each participant only resided in one of six different states, and the assessment was only taken by individual participants had access to the Internet and the particular website utilized. It is recommended that future research consider how other factors, such as location, culture, race, socioeconomic status, or possibly childhood abuse, may affect aggressive behavior. Following the findings of this study, this investigator was elated to discover how male psychological development in age produces changes in aggression levels. The knowledge that young-adult males are more prone to antisocial behavior than middle and mature-adult males may assist examiners in a professional manner. Through this improved understanding of male comportment factors, professional helpers may constructively counsel males, who might display this sort of behavior. Enriched knowledge in this area of interest may also assist counselors and psychologists with the counseling of possible victims of physical and emotional violence. The links indicated in this article might aid individuals in the appreciation that aggression levels displayed by a friend, significant other, or early-adult family member, may, by all means, be normal, as long as the behavior is not overly severe and/or long lasting. Individuals, who realize that they frequently act aggressively, may even be persuaded to take a moment to “think before they act” and learn to behave in less aggressive manners, ultimately refining themselves and society as a whole. Hanrahan C (2006) Antisocial Behavior. Gale Encyclopedia of Children's Health: Infancy through Adolescence. Sigelman C, Rider E (2015) Life-Span Human Development. (8th edn), Cengage Learning, Stamford, USA, pp. 421-425. Meyer R (2005) Chapter 11: The Personality Disorders. In: Allyn & Bacon (Eds. ), Case Studies in Abnormal Behavior. (7th edn), pp. 202-206. Goleman D (1990) Aggression in Men: Hormone Levels Are a Key. New York Times. Monahan (1981) Specific Indicators of Aggression. Letich L (1991) Do You Know Who Your Friends Are? Utne Reader 85-87. Armstrong T (2008) The Twelve Stages of the Human Life Cycle. American Institute for Learning and Human Development. Paludi M (2002) Human Development in Multicultural Contexts: A Book of Readings, Upper Saddle River, New Jersey, USA, pp. 187-214. Begley S (1999) Why the Young Kill. Newsweek. Krogstad J, Cohn D (2014) U.S. Census looking at big changes in how it asks about race and ethnicity. Pew Research Center. Zimbardo P (2004) A Situationist Perspective on the Psychology of Evil: Understanding How Good People Are Transformed into Perpetrators. The Social Psychology of Good and Evil: Understanding Our Capacity for Kindness and Cruelty, New York, USA. Peña M, Andreu J, Graña J, Pahlavan F, Ramirez J (2008) Moderate and Severe Aggression Justification in Instrumental and Contexts. Social Behavior and Personality 36(2): 229-238.